Us: What? Aren’t you going to negotiate? Them: Shut the door on the way out would you? Them: What, are you still here? We are convinced that there are several ways of doing many things. 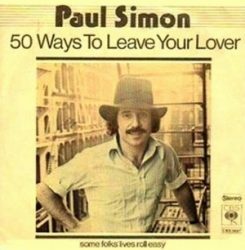 We are hugely impressed that Rhymin’ Simon found fifty ways of doing just one. Maybe he should be on our ‘negotiating’ team. After all he named this song after Article 50.